We were heading down to Hartland, a rugged peninsula off the Atlantic coast and home to Loveland Farm and Griffin Studios. The journey down led us along country roads that diminished in size until finally we found ourselves rallying down sweeping country lanes pushing our hire car to its limit, the little MG didn’t have a lot to give. We climbed out of the car and the sheer lucidity of the night sky told us how far we had come. The stars reached out in all directions and the Milky Way stood as a clear swirl of galactic proportions. All around us were the glowing Domes of Loveland cropping out from the hillside and the sounds of piglets grunting. The creation of designers Jeff and Karina Griffin it is a clear extension of their brand Griffin, a stylish sustainable environment and a level of luxury built on solid values and beliefs. A wood burner kept our dome warm as we drank wine and looked out across the hillside submerged under the canopy of stars. 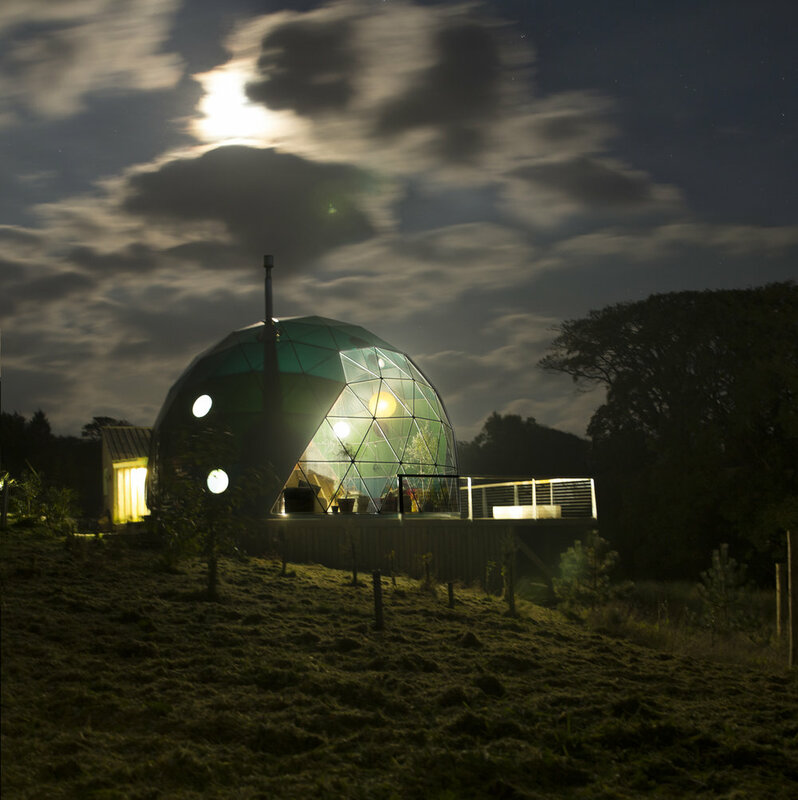 Waking up and we got to take in the full spectrum of life at Loveland farm, with water buffalo, pigs and sheep interspersed amongst futuristic domes. We ate a breakfast of bacon and sausages that were made on the farm and avoided eye contact with the neighbouring piglets as we did. Jeff pulled out a 250cc KTM and a military land-rover and we headed out along the lanes before heading off road, what ever was the quickest route. Our first stop was just over the hill to Hartland Quay were they hold a hill climb twice a year. We had arrived at night and coming over the brow of the hill to see the sweeping descent to the quay and the rugged cliffs on the Atlantic coast was incredible. The landscape is a dramatic collage of tectonic movement with granite outcrops at jagged angles, it made the perfect backdrop to a motorcycle race, it seeped of fear and power. The purpose of the trip was partly to go through the next stage of designs for our forthcoming collaboration. Our aim is to design a jacket that provides complete encapsulation from the elements as well as the road, bringing technical and luxury fabrics together with style and good design. Jeff had designed four versions of a jacket using a variety of fabrics. These ranged from classic American Woolwich buffalo check to locally produced Fox bros Mill and variations in Cordura. As well as innovation through function the jacket re-imagines the motorcycle jacket through the contemporary vision of Jeff Griffin. We will be travelling to Italy in the coming weeks to work on the next final sampling with and aim to be launching early next year. 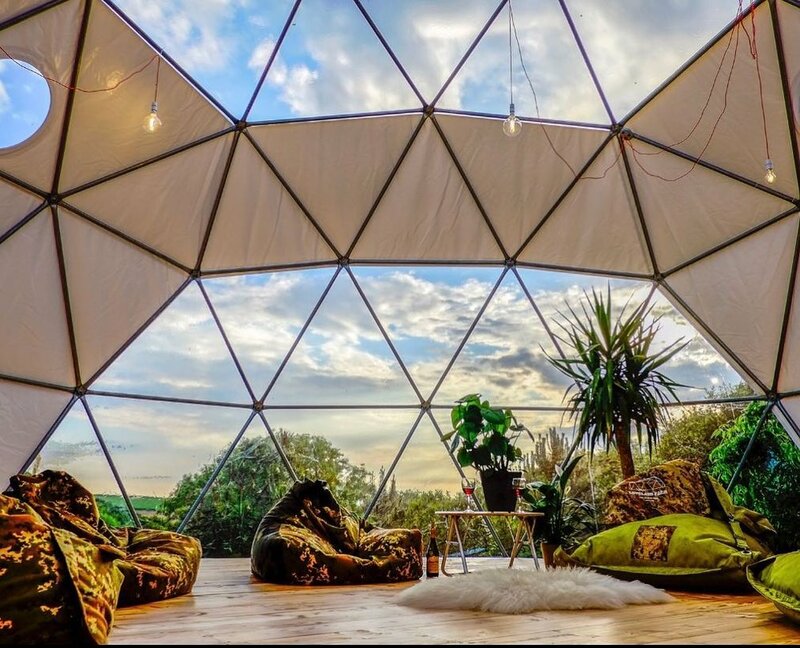 It was hard not to be overwhelmed by life on Loveland farm, from the incredible landscape to mixture of futuristic domes and hards of animals, a working sustainable lifestyle and every bit the utopian dream. It was the perfect place to design a jacket and we will be putting it to the test on the next Hill Climb.